Sussex Spaniels: What's Good About 'Em? What's Bad About 'Em? Sussex Spaniels: the most honest dog breed review you'll ever find about Sussex Spaniel temperament, personality, and behavior. Matching his somber, almost frowning expression, the Sussex Spaniel is calmer and steadier than most other spaniels, though he does conceal a dry sense of humor. This long, low, heavyset dog is rather phlegmatic indoors, but loves the outdoors and will bound through the fields in search of lurking creatures. The Sussex Spaniel is aloof with strangers and sometimes even protective (very unusual for a spaniel). But once guests are accepted, he becomes polite, even charming -- as long as he has been well-socialized. Sussex Spaniels can also be pushy with strange dogs (again, unusual for a spaniel). His tendencies toward dominance and stubbornness require a consistent owner who knows how to lead and who will use positive, upbeat training methods. This proud dog will stand up for himself if handled sharply or teased. Finally, the Sussex Spaniel is noted for being one of the most vocal of the spaniels, tending to bark and howl, especially if left alone too much. And he can be slow to housebreak. A Sussex Spaniel may be right for you. A Sussex Spaniel may not be right for you. You can avoid some negative traits by choosing an ADULT dog from an animal shelter or rescue group. With an adult dog, you can easily see what you're getting, and plenty of adult Sussex Spaniels have already proven themselves not to have negative characteristics. Finally, you can avoid some negative traits by training your Sussex Spaniel to respect you and by following the 11-step care program in my book, 11 Things You Must Do Right To Keep Your Dog Healthy and Happy. Providing enough exercise. Sussex Spaniels were developed to run through the fields seeking birds for the hunter to shoot. So life in an apartment or an occasional walk around the block isn't enough for this breed. Provide them with enough space to vent their energy with a vigorous daily romp. Otherwise they will become bored, which they usually express by barking and howling and chewing destructively. Stubbornness. Despite their easygoing nature, Sussex Spaniels are stubborn, and to get their own way, they can be manipulative. You must show them, through absolute consistency, that you mean what you say. In other words, you must teach your Sussex Spaniel to respect you. A dog who respects you will do what you say and will stop what he's doing when you tell him "No." 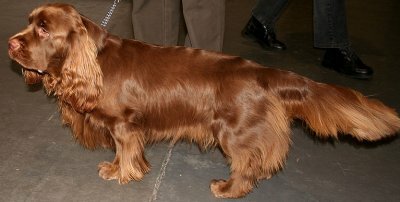 Read more about Sussex Spaniel Training. Grooming and shedding. To keep their silky coat free of mats, Sussex Spaniels require regular brushing and combing, and occasional trimming. And like most spaniels, Sussex Spaniels shed a lot. Slobbering. Some Sussex Spaniels with heavy jowls tend to slobber their water, and some drool. Finding one. The Sussex Spaniel is one of the rarest breeds in the United States, so you should expect to go onto a waiting list.